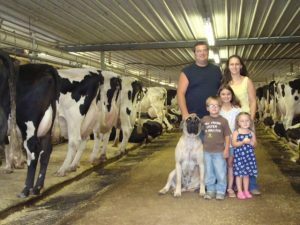 Andrea and Cliff Sensenig run Sensenig Dairy, a 100-cow farm in Kirkwood, Pennsylvania and as part of their commitment to dairy sustainability they installed an anaerobic digester to covert manure from their dairy herd into power. But they didn’t stop with the ‘offerings’ from their cows. The Sensenigs teamed up with the local community to collect enough waste to produce 1,401,600 kilowatt hours of electricity a year. This offsets 989 tonnes of greenhouse gas emissions every year, equivalent to removing 206 cars from the road. Also, an underground pipeline has alleviated the need for trucking, reduced the possibility of manure spills and improved air quality by reducing odor by 80 percent. 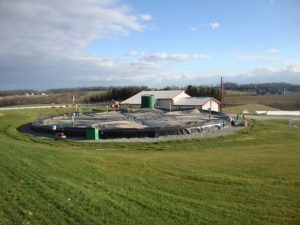 The community digester at Sensenig Dairy is fed six times a day by manure from 200 dairy animals, 2,000 pigs and 30,000 chickens. Local grocery stores also contribute to the digester by adding food waste. The project has reduced greenhouse gas emissions, taxes, bedding and fertilizer costs, while also creating new revenue streams including the sale of carbon credits, fertilizer and bedding. Because the digester produc es three times the amount of energy the dairy needs, the dairy also generates revenue by selling energy back to the grid. enterprise, but the dairy could keep its status as a farm. And they share their knowledge and experience with others and have hosted two educational events focused on teaching farmers about the feasibility of implementing digesters and dairy sustainability on small dairies. To learn more about the Sensenig Dairy’s commitment to sustainability click here.